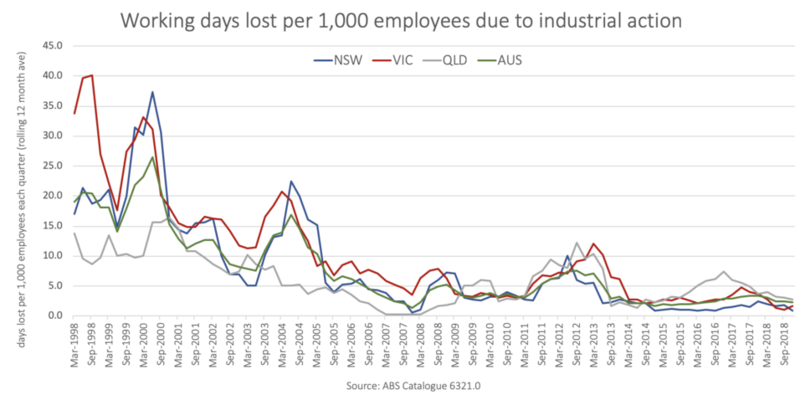 Latest data from the Australian Bureau of Statistics reveals Queensland lost 25,300 working days in 2018 due to industrial action. Queensland has more working days lost per 1,000 employees than both NSW and Victoria. However this should be placed in context against the fact that current days lost due to industrial action remain very low by historical standards. Please see my earlier post on how industrial action is taken under the Fair Work framework. 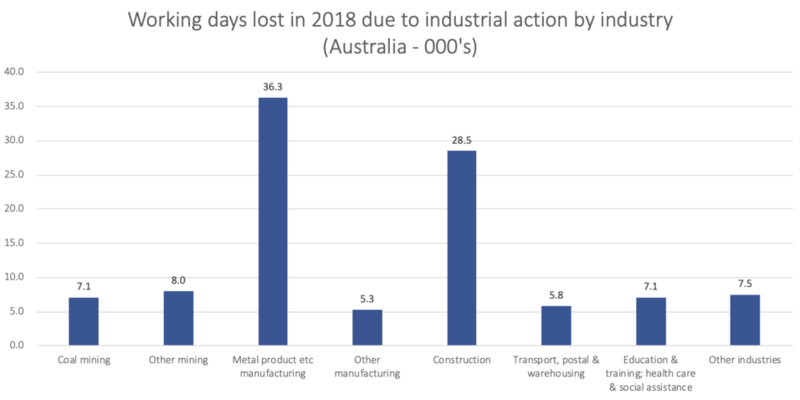 Broken down by industry metal product manufacturing and construction are the two industries with the highest working days lost due to industrial action in 2018. 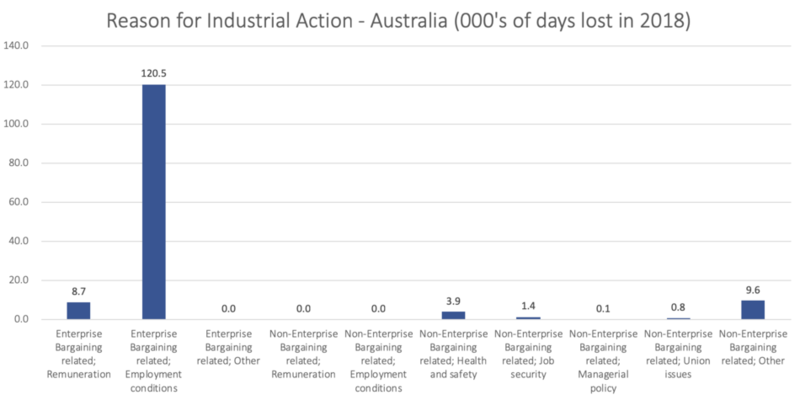 The main reason for why industrial action was taken in Australia in 2018 relates to employment conditions as part of enterprise bargaining (EA). That is, strike action is taken to place pressure on an employer for more favourable terms in an EA that is under negotiation. Other major reasons for industrial action relate to either remuneration as part of an EA negotiation or for workplace health and safety reasons. WHS action on the face of it sounds pretty reasonable however there are instances where this has been used as a form of 'industrial bastardry' to coerce companies negotiating an EA. A link to industrial action statistics in Australia can be found here. Each year the Fair Work Commission (FWC) is responsible for reviewing and setting minimum wages for employees as part of an annual wage review. The Commission issues a decision for the national minimum wage (NMW) and for pay rates for all 122 modern awards, which comes into operation on 1 July for the following financial year. providing a comprehensive range of fair minimum wages to junior employees, employees to whom training arrangements apply and employees with a disability. As part of this process the Commission invites relevant parties (Unions, employer groups, State and Federal Governments and Oppositions) to put forward their own recommended increase and position. An analysis of these recommendations again reveals wide variation in proposed increases. These I believe define the playing field but given the average increase over the past nine years has been $19.50 or 3.2 per cent many of the recommendations for 2019-20 are no more than extremity values or ambit claims that I have previously been critical of. I continue to believe it is in all employee and employer interests for unions and employer groups to work together to try and work out a consensus position. This potentially achieves balance between the competing outcomes of profitability, more employment hours and higher wages leading to an overall lift in the standard of living. See my blog on this issue here. In trying to predict the FWC's decision for 2019-20, the Reserve Bank of Australia believes economic growth will increase despite a revision downwards as part of their latest Statement on Monetary Policy (see below). On the basis of these forecasts it is reasonable to expect that the FWC will again land at a decision in between 3.25 – 3.5 per cent and I believe it will be in that band’s upper range. 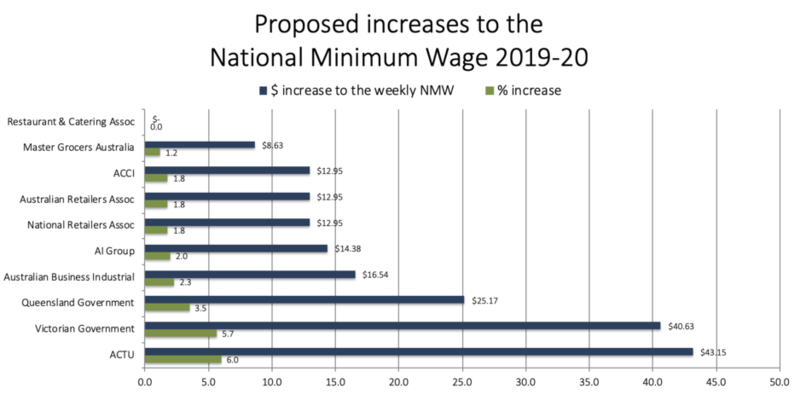 Accordingly, I am anticipating an increase in the NMW in the order of $25.17 (For what it is worth last year I predicted a $21.50 increase against the FWC decision of $24.30). Any increase will apply from the first full pay period starting on or after 1 July 2019, for employees on the national minimum wage or a modern award. There will over the coming weeks and months be considerable scrutiny on wage levels in Australia as the Fair Work Commission’s Annual Wage Review for 2018-19 kicks off. This process adjusts the National Minimum Wage and the rates of pay for Australia’s 122 modern awards. At present everyone tends to focus on 'nominal wages' where as a better indicator is unquestionably ‘real wages’ which adjusts for inflation. This represents a true indication of whether the purchasing capability of an individual is increasing or not. This is a much better measure for a livelihood. 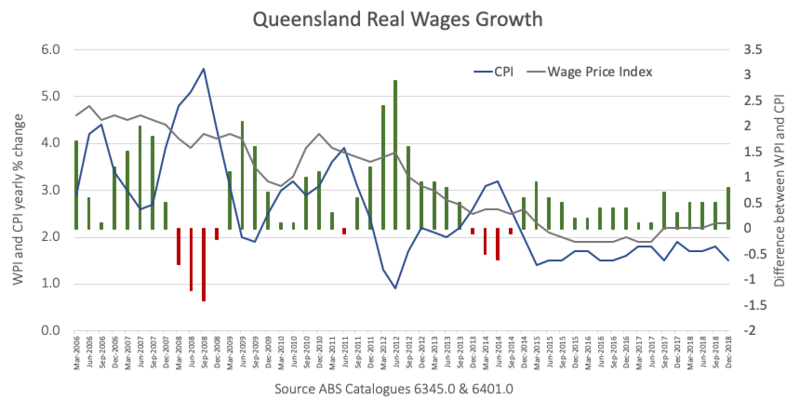 Queensland’s inflation levels (as measured by the Brisbane CPI) have been lower than those Nationally and hence real wages growth in the Sunshine State has actually been higher. 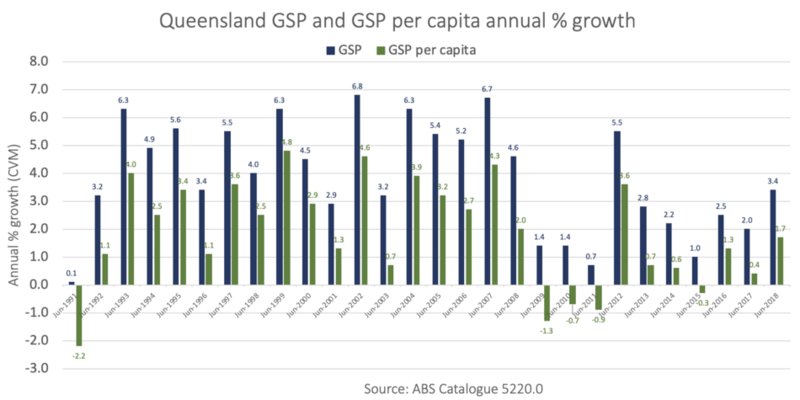 Queensland real wages growth in the year to the December quarter 2018 was 0.8 per cent and compares to the long term trend of 0.6 per cent. Queensland real wages growth is now at it highest point in the last four years and is at its second highest level since the mining investment boom. 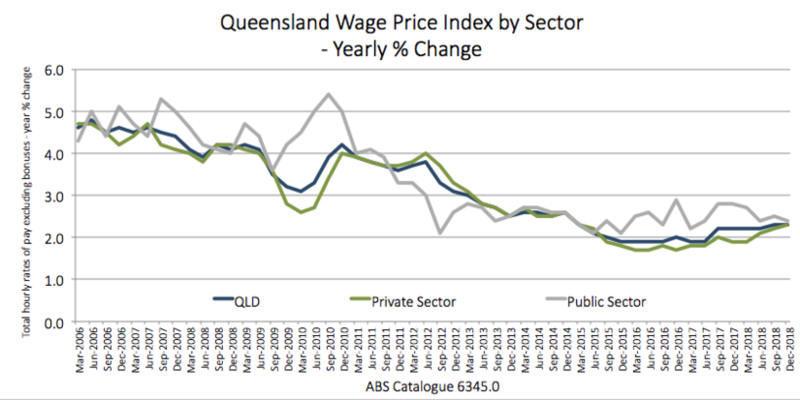 Queensland real wages growth of 0.8 per cent is noticeably higher than the national rate of 0.5 per cent. Queenslanders in considering the debate on wages growth need to firstly differentiate between nominal and real wages growth. In real terms we are starting to do ok.
Secondly Queenslanders need to differentiate our State with what is occurring nationally. 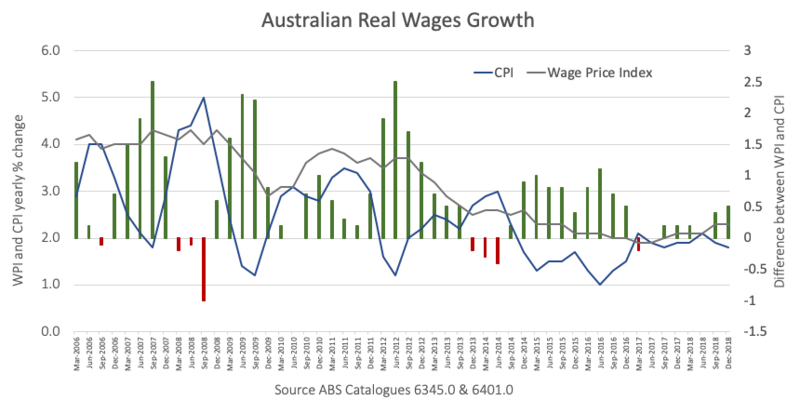 At a national level real wages growth continues to remain 0.2 per cent under the long term trend and it is this that is giving rise to union campaigns for higher wages. 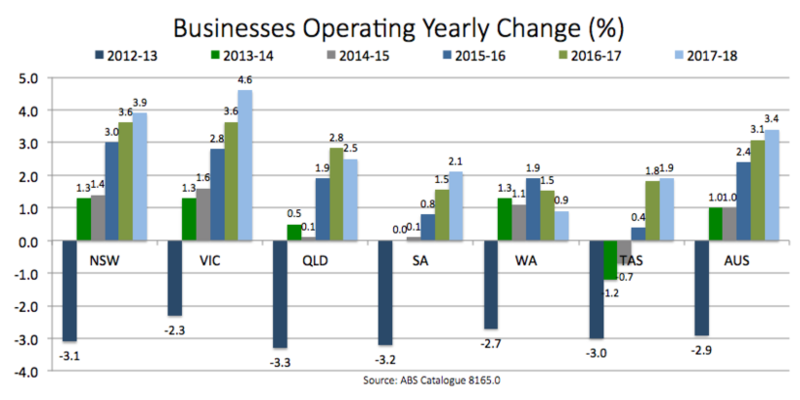 The final point I would make is that there have been three occasions whereby real wages have gone backwards in Queensland …. in 2008, briefly in 2011 and then again in 2014. 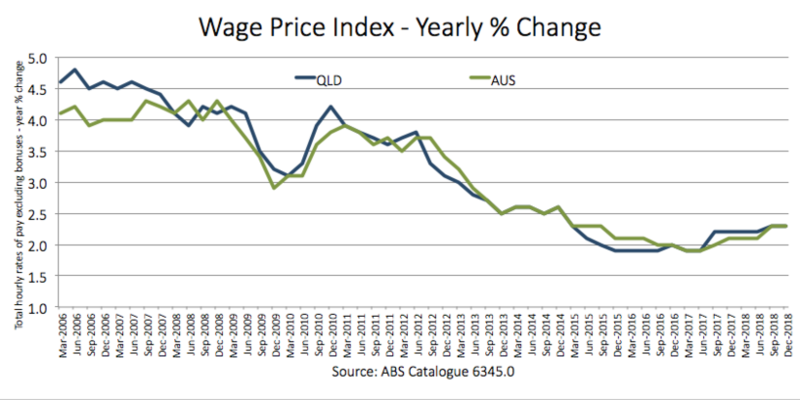 However, Queensland and Australian wage levels at present are definitely, 100 per cent, NOT going back at present despite many claims to the contrary. Talk of a 'GDP per capita recession' is complete nonsense – not because it is statistically not the case but because it has little to no context relevance. 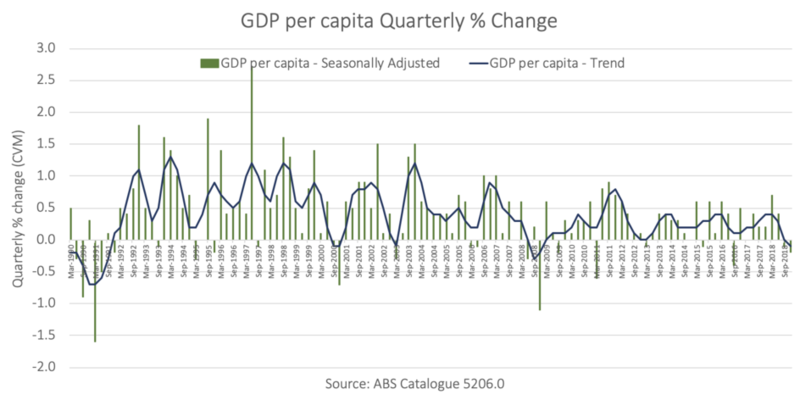 When the national accounts were released this week Australia’s GDP per capita (that is GDP per head of population) in seasonally adjusted terms declined two quarters in a row. Both the Federal Opposition and the media went somewhat into a frenzy stating we were in a ‘per capita recession’. However, I have really struggled to get my head around why we have all of sudden started using this indicator outside of its benefit as a measure for the standard of living. It is not an indicator for measuring whether we are in a recession. You see economic growth as measured by GDP, is jointly determined by the three Ps — changes in population, its rate of participation of the working aged in economic activities (also referred to as 'labour utilisation'), and labour productivity. Why we are all of sudden dismissing growth that arises from population growth is baffling. Population growth is a good thing as it buoys our economy through creating demand for goods and services. 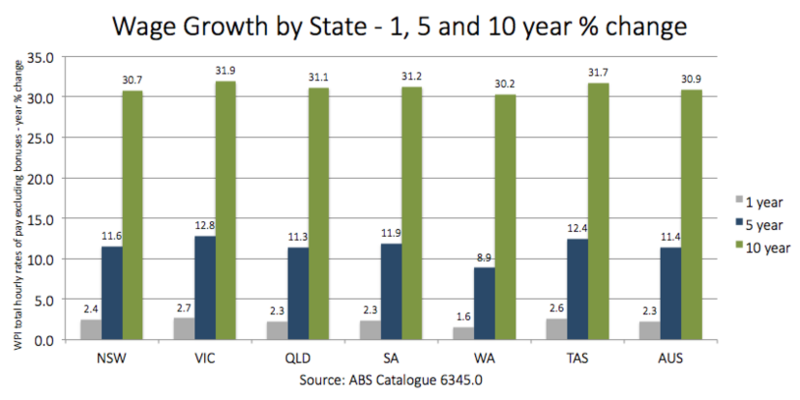 This point is best illustrated in analysing Queensland’s economic growth for example. The Sunshine State has relied on population growth over the past several decades for much of its prosperity. Indeed, if we applied the same logic from the debate over the past week then Queensland’s economy might well have been in recession in 2009 through to 2011 and again in 2015. This is quite possible but in technical terms it was not and I witnessed no one using a 'per capita' measure to claim it was. In short ……. growth is growth regardless of why it is occurring. 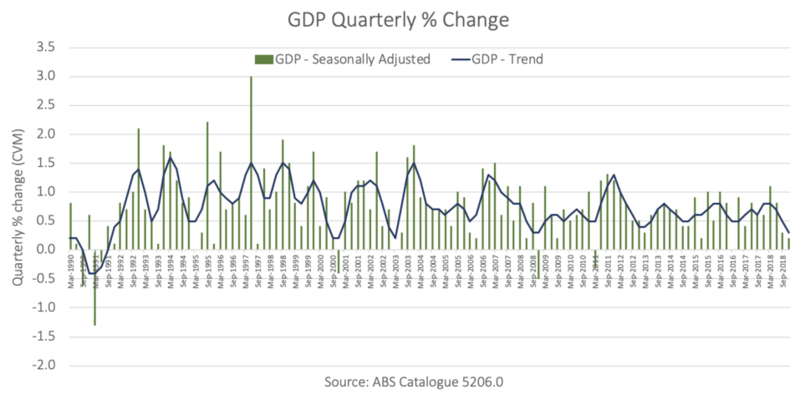 The point that should have been made though this past week, is that in analysing GDP quarterly growth for Australia, a downturn in economic growth is unmistakable (see below). However, talk of a recession at present is quite simply utter nonsense and is only part of a narrative in the build-up to the forthcoming Federal Election. 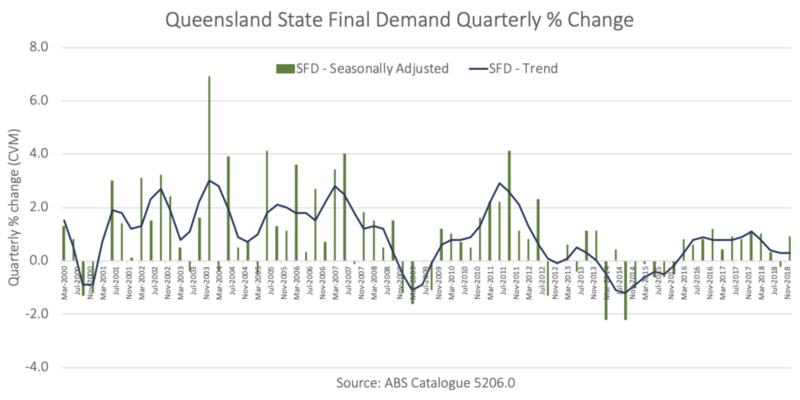 Finally Queensland's domestic economy as measured by State Final Demand is also slowing in trend terms. This will, without a shadow of a doubt, have implications for employment, our unemployment rate and wages growth in 2019. Over the next five years Brisbane will experience a once in a generation level of investment in new major projects on a scale that no-one will have seen before not even for Expo 88. At no time in this state’s history have such significant projects been undertaken at a similar time that will redefine the visitor and living experience in Queensland’s capital city. Individually each of these projects is impressive but collectively they represent a once in a generation level of investment coming on line within a narrow window of our capital city’s history. Each of these projects will represent enormous opportunity to their respective supply chain but will also cascade considerable benefit as anchor points to surrounding businesses. Employees will spend their hard earned wages throughout the suburbs of Brisbane further spreading the economic boon. Arguably Brisbane’s current economic profile relies heavily on locally generated revenues and opportunity but these projects regear our capital city for the global marketplace thereby offering a buffer or hedging opportunity to commodity prices and global demand for our resources. What I particularly like about these projects is the symbiotic relationship between the infrastructure gateways such as BNE’s new runway and the International Cruiseship terminal and the other developments that are occurring. Without the gateways tourists would not be able to visit the new entertainment establishments and without these establishments visitors would not be transiting the gateways. These projects will mutually benefit each other. Potentially these projects represent the tip of iceberg with other key land precincts such at the Parmalat Milk Factory in Brisbane’s West End and the Bulimba Barracks redevelopment also in the pipeline. This is the opportunity we have been looking for where Brisbane can become a destination of choice in Australia. Unquestionably people and investors internationally are and will be sitting up and taking note. BRISBANE LIVE - $2 billion, 2018 - 2022: Brisbane Live is a $2 billion arena-centred entertainment precinct at Roma Street, Brisbane with a Madison Square Garden-style 17,000 seat entertainment arena as its centrepiece, along with outdoor amphitheatres, cinemas, restaurants, bars, hotels, and residences. BRISBANE METRO - $1 billion, 2017 - 2023: The Brisbane Metro is a high frequency rapid transit transport system along 21km of existing busway from the Royal Brisbane and Women’s Hospital to Eight Mile Plains. It includes 18 stations, including 11 interchange stations, two of which will link with Cross River Rail. MILLENNIUM SQUARE - $2 billion, 2018 - 2021: Millennium Square is touted as Australia’s first ‘mediapolis’, co-locating new knowledge media businesses in a worldclass workplace within a vital and vibrant urban precinct. The project’s major features include a 44,000sqm commercial office building, a media innovation centre, high quality retail centre of up 42,000sqm, up to 1700 rooms across seven apartment towers and a 187-room hotel and public plaza. BRISBANE SHOWGROUNDS - $2.9 billion, 2017 - 2018 (stage 3): The regeneration of the Brisbane Showgrounds is transforming more than 22 ha on the Ekka site into a vibrant year round destination. It includes 340,000sqm of residential, commercial and retail buildings, together with an additional 76,000sqm of new development on RNA retained land. CROSS RIVER RAIL - $5.4 billion, 2017 - 2024: Cross River Rail is a 10.2km rail line between Dutton Park and Bowen Hills that includes a 5.9km twin tunnel under the Brisbane River and the CBD. The project includes four new underground stations at Boggo Road, Woolloongabba, Albert Street, Roma Street and redevelopment of two existing over ground stations at Dutton Park and the Exhibition which will be used by 164,000 passengers daily. Each new station will generate unique opportunities for property development and economic growth and revitalisation of these inner-city precincts. BRISBANE QUARTER - $800 million, 2016 - late 2019: Brisbane Quarter at 300 George Street includes Australia’s first purpose-built W Hotel, two levels of riverside dinning and luxury retail shopping beneath a 40 storey state-of-the-art Prime Grade office tower and an 82-storey luxury residential apartment building. QUEEN'S WHARF - $3.6 billion, 2017 - 2024: Queen’s Wharf is an integrated resort development covering more than 26 ha. 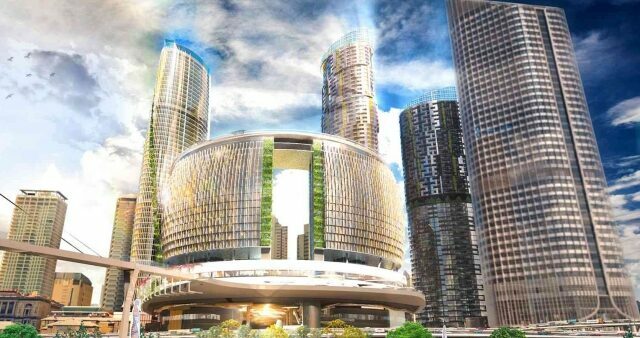 The project includes five new hotels, including The Ritz-Carlton Brisbane and the six Star Rosewood, which will provide more than 1000 hotel rooms. SOUTH BANK SOUTHPOINT - $600 million, 2016 - 2018: Southpoint is home to Brisbane’s second luxury boutique Emporium Hotel plus three towers comprising 413 residential apartments, commercial office space, and an estimated $40 million, 4500sqm retail and dining plaza. HOWARD SMITH WHARVES - $110 million, 2017 - late 2018: The Howard Smith Wharves are being transformed into a world-class 2.7 ha riverside recreation, lifestyle, event and tourism precinct with access to and from the Brisbane River. WATERFRONT PRECINCT - $1.5 billion, 2020 - 2026: A new waterfront precinct which includes parkland, retail, hotel and commercial space over 3.2 ha of prime waterfront CBD at Eagle Street Pier, Eagle Street (gold tower), 12 Eagle Street (blue tower) and Naldham House (Brisbane Polo Club). BRISBANE AIRPORT SECOND RUNWAY - $1.35 billion, 2017 - 2020: Brisbane Airport’s second runway will cater for an increase of about 28 million annual passengers by 2034. The second runway will be 3.3km long, 60m wide, located 2km west of and parallel to the existing runway. NORTHSHORE - $5 billion, 2020 - 2035: Northshore is the largest waterfront urban renewal project in Queensland with luxury riverside apartments, commercial space, boutique retail shops, restaurants and bars. Up to 20 per cent of the site is green space with landscaped parks and swimming pools. INTERNATIONAL CRUISE TERMINAL - $160 million, 2018 - late 2019: Brisbane’s first mega-cruise ship terminal at Luggage Point will be able to cater for vessels longer than 270m. The terminal building will be 9300sqm set over two levels and connected to a 200m long wharf with two air bridges for passengers. There will also be public open spaces, parking, plus extensive landscaping across the site. GABBA PRECINCT UPGRADE – TBC, TBC: The Gabba’s 10-15-year ‘master plan’ includes a new “grand entrance” to the stadium, landscaped public gardens with big screens, and walkways over Main, Vulture and Stanley streets. HERSTON QUARTER - $1.1 billion, 2018 – 2028: Two kilometres north of the Brisbane CBD, the Herston Quarter – located within Queensland's Herston Health Precinct – is planned to undergo $1.1 billion development. Comprising approximately five-hectares adjacent to the Royal Brisbane and Women's Hospital, the site will provide access to leading health, hospital and aged care services. Over the next 10 years, the planned $1.1 billion development will involve multiple integrated buildings, including a new specialist public health facility, a new private hospital, aged care and retirement living, residential and student accommodation, childcare, car parking and an array of public spaces. If you want to know more about these projects please go to the BNE 2025 website by clicking here. 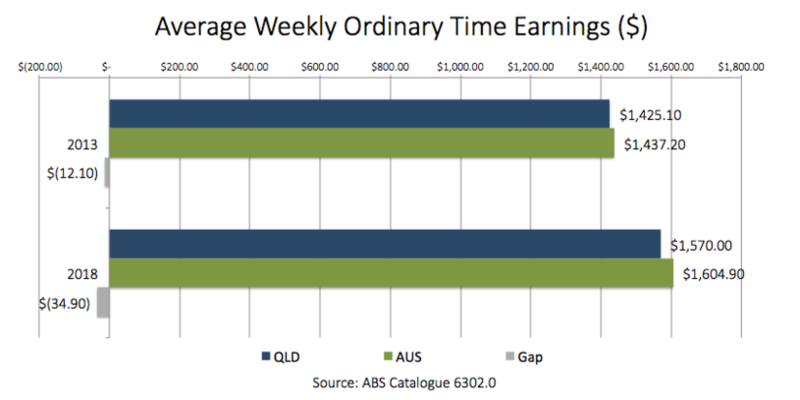 For example the difference between Queensland’s average weekly ordinary time earnings and Australia’s in 2013 was $12.10. 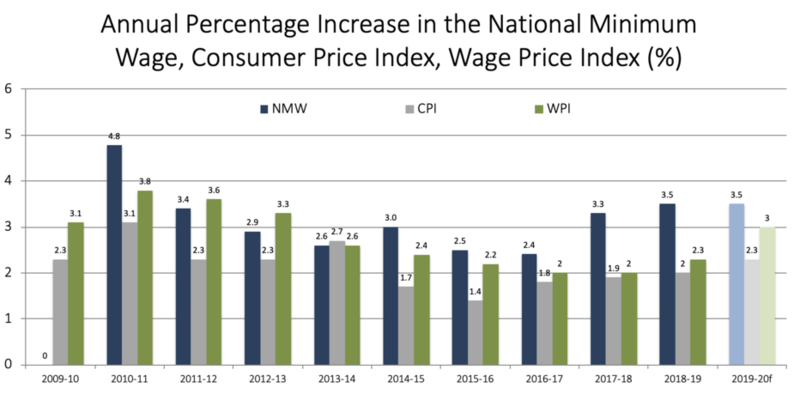 In 2018 due to lower wages growth the gap has increased to $34.90. That is, because we have not kept up with national wages growth, Queenslanders have fallen behind to the tune of $1,185.60 each year. ​The overall outlook for wages growth indicates it will continue to experience modest improvement in line with a broader improvement in the labour market. 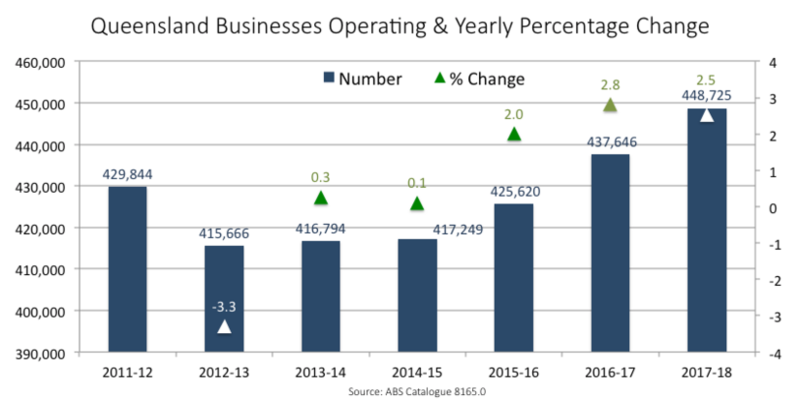 The ABS have released their Counts of Queensland Businesses including entries and exits and the story in the main is a positive one for Queensland in 2017-18. 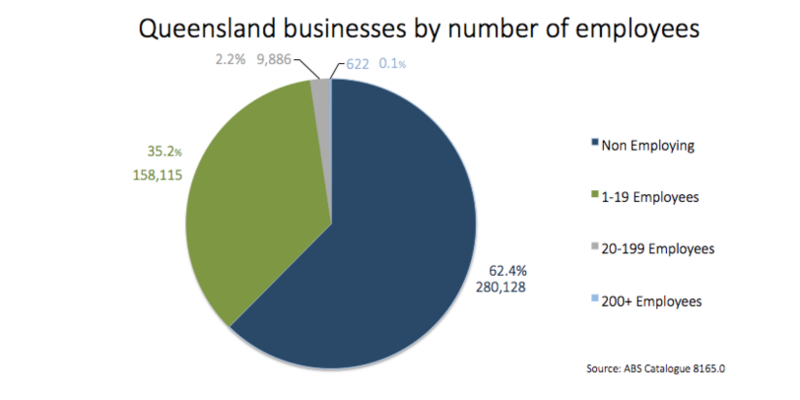 Finally 97.6% of all businesses in Queensland are a small business employing less than 20 employees. Queensland's unemployment rate remains unchanged at 6.1% in trend terms and is down from 6.1% to 6.0% seasonally adjusted. Nationally the unemployment rate remains unchanged at 5.1% (trend) and 5.0% (seasonally adjusted). 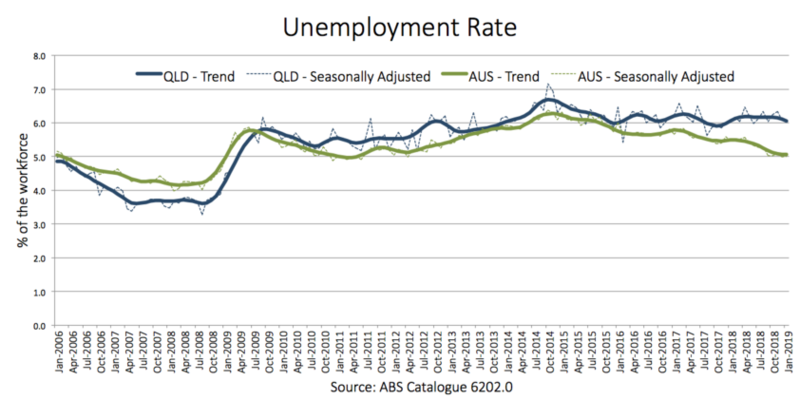 For Queensland's trend series there was an increase in total employed persons and a reduction in unemployed persons but not enough to shift the unemployment rate. In seasonally adjusted terms there was a fall in total employed persons but also a fall in unemployed persons that led to the lower unemployment rate. Queensland's underemployment rate (measures those persons wanting additional hours of work) has improved in the past six months and currently stands at 8.8%. 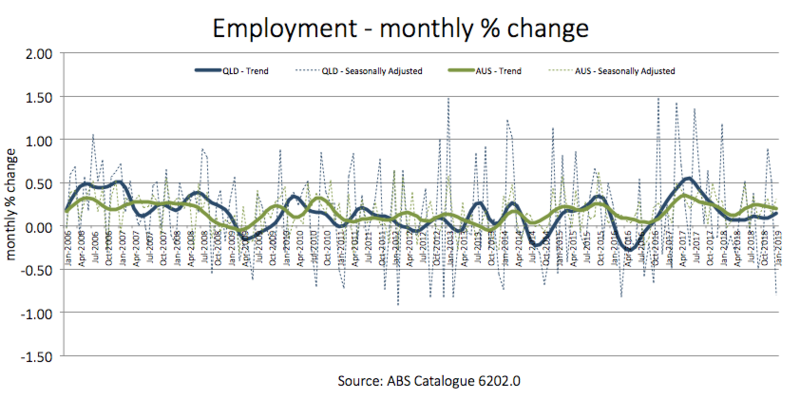 Queensland's employment growth is slowly starting to improve. In trend terms there where 3,500 jobs created in January 2019 and over the past 12 months 27,700 jobs have been created. 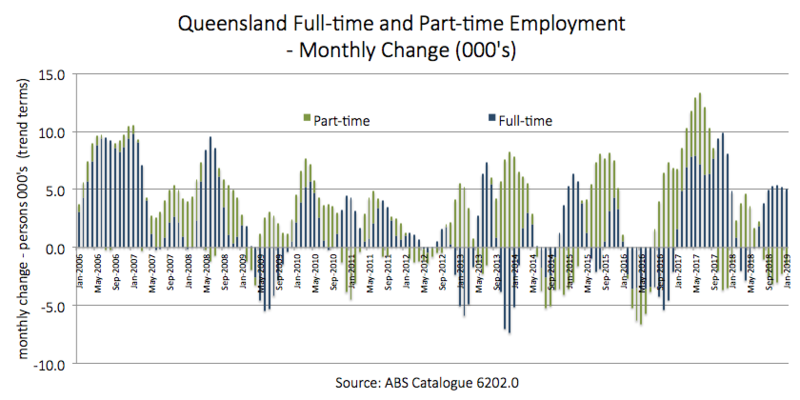 Queensland's employment growth in the last six months has been largely driven by full-time positions. 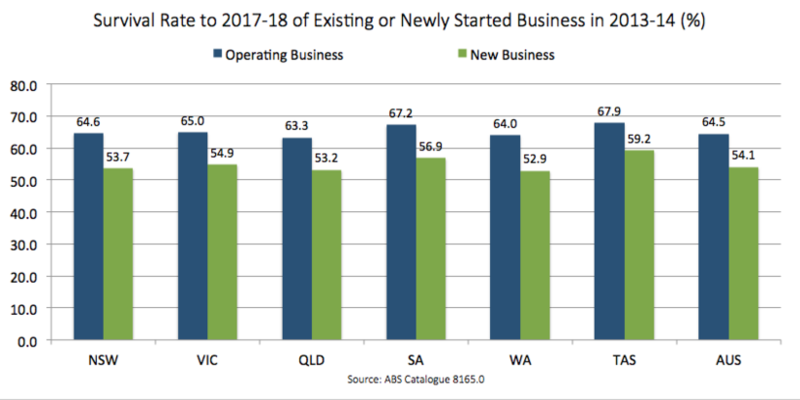 Total hours worked in Queensland whilst flat across much of 2018 has expanded recently indicating more demand in the economy for labour. 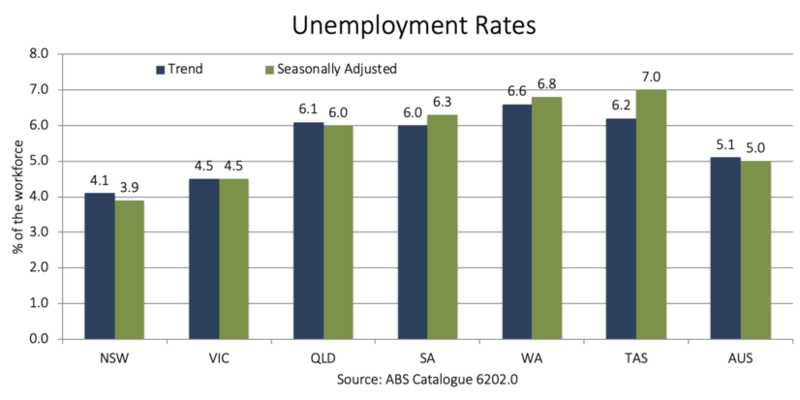 As an aside NSW would now be regarded as being close to what is termed 'full-employment' with an unemployment rate at 3.9%.